Groupo Veneaviones' AC690 Turbo Commander updated for FSX Acceleration with a VC glass and gauges fix. By Josh Jones. 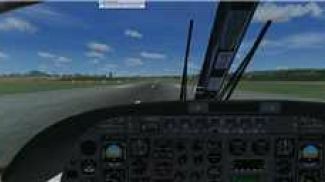 Screenshot of Groupo Veneaviones' AC690 Turbo Commander in flight. 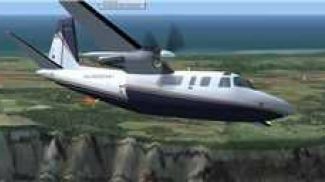 I really enjoyed this Veneaviones AC 690 Turbo Commander back when I was running FS9. I always looked for a port over, but could never find one. I was fooling around online and came across a SimOuthouse forum post that told me which texture was the VC glass. I substituted the glass with a texture that I robbed from Eduardo Fadul's freeware Mig-29 Fulcrum. I use them for this purpose alot, as they seem to work ok for overwrites for glass that is opaque in FSX. You will have to install the texture file (text_vc4) into any texture folder that you want to use, you probably know the drill. Overwrite, etc. For the panel update, I simply added native FSX gauges into the problem slots. Known issues are that in some textures, the overhead switches in the VC seem semi-transparent. I don't spend a lot of time staring up at the ceiling, so they don't really bother me. These files shouldn't harm your computer, but if they do, don't blame me. Also, this update is for upload to sites that do not charge a fee for access. Thanks for downloading and reading, hope you enjoy. Thanks Groupo Veneaviones for a great model!! Virtual cockptit of Groupo Veneaviones' AC690 Turbo Commander. The archive veneaviones_ac690_fsx_conversion.zip has 9 files and directories contained within it. Dear friends, my name is alberto roses and are pilot of a Commander 840 turbo, also I have my Simulator FS9 where I have a commander of you, I think an miss a great job of creating this plane for simulators before and today . I would like to ask if they could make or design the commander turbo that has my company I would like to send them the information and if they can make our aircraft for the new simulator p3d be great, the cost of it we would cover the collection, if any other form of power talk to you would give me pleasure to do so thank you very much for your attention and I am awaiting their response.